Rates for packing and unpacking vary, depending on the service the customer chooses. The containers and materials used in the moving procedure are included in the total cost. Browse through our Rates page to find the applicable rates that apply for different services and other charges. US Power Movers works closely with the client to ensure complete satisfaction and mutual conformity. 1. Shipper elects not to have unpacking performed and elects to retain the containers and specifically directs carrier or his agent not to perform unpacking. 2. Shipper elects not to have unpacking performed at time of delivery and specifically so directs carrier or his agent. 3. Shipment is delivered to a warehouse. 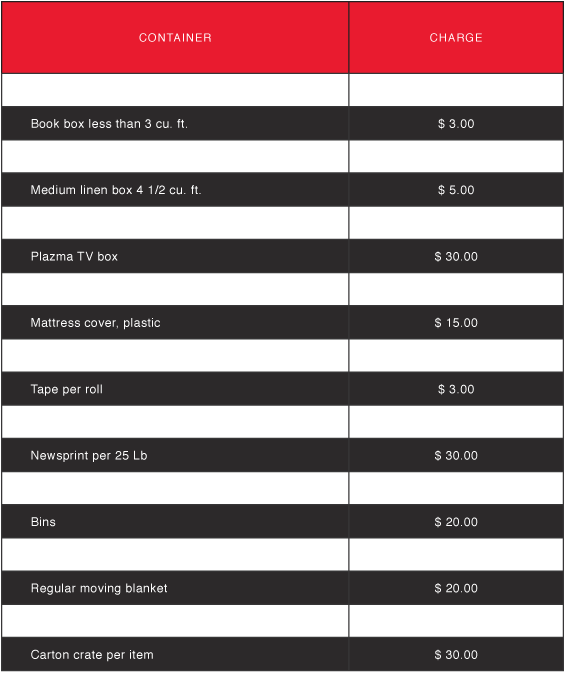 DELIVERY OF PACKING MATERIALS (cost per delivery) $ 30.00 within 20 miles from US Power Movers base. Travel time is a charge not based upon geographical location of carrier. These charges are in addition to all other rates and include one-way mileage from place of origin to destination based on the latest issue of the Household Goods Carrier Bureau Mileage Guide. Regular hours apply when service is requested to be performed Mon to Sat from 8 A.M. to 7 P.M. Overtime rates apply when service is requested to be performed Mon to Sat from 7 P.M. to 8 A.M. Minimum charge of 3 hours on regular time moves. Minimum charge of 3 hours on overtime moves. Minimum charge of 5 hours on Sunday and Holiday moves. Shipper to pay all tolls involved in the move. A) Deposits: Equaling 20% of the total estimated cost of the move will be required from the shipper to reserve the move date. Said 20% will be payable on the day of estimate. Said deposit will accrue toward the payment of the total cost of the move as stipulated in the bill of lading. B) Refund: US Power Movers must receive formal written notice seven days prior to the scheduled move date in order to refund any deposit. 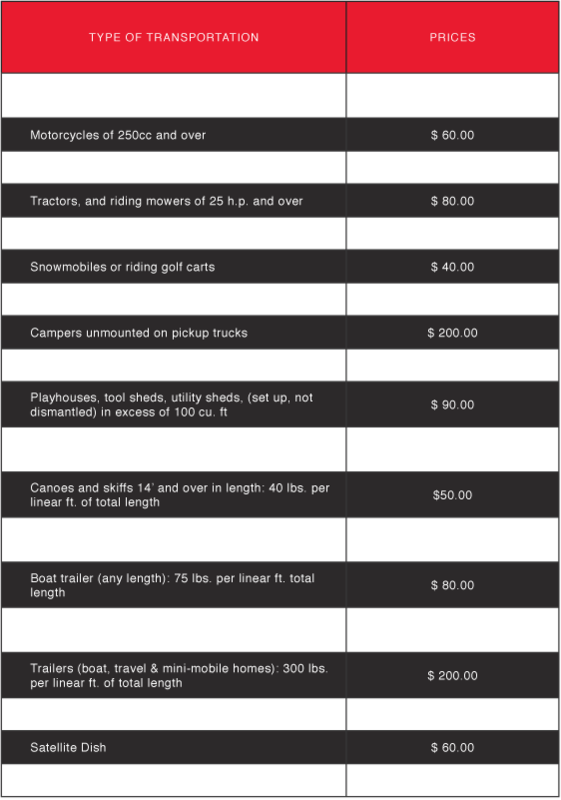 These charges are in addition to net weight or cubic ft. measurement of shipment.